In a bowl, mash the avocado and mix with the mayonnaise, mustard and adobo sauce until completely smooth and combined. To assemble the sandwich rolls: With a rolling pin, roll out each sandwich bread slice until completely flattened. 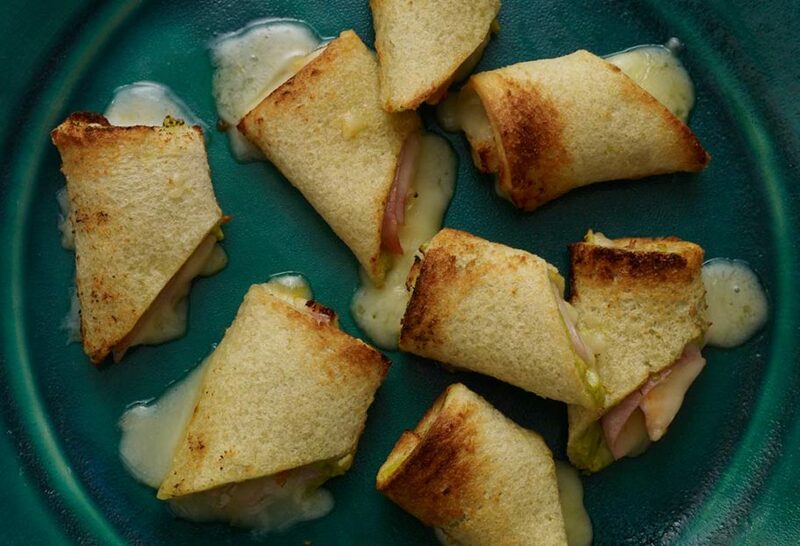 Leaving at least 1 inch around the edges of the bread, spread on a generous tablespoon of the avocado mixture and top with a slice of ham and cheese. Roll up the sandwich and pat to flatten a bit with your hand once you are done. With a sharp knife, cut off the ends of the sandwich roll (less than 1/4-inch) and cut the sandwich roll in half, diagonally. If sending them to school, pack as is and lay flat on their side. If you are eating them at home, you can place them in the toaster oven for 2 to 3 minutes and stand them up on the cut flat side. This was a big hit with my family! We had them for dinner and gobbled them up. One of my kids begged me to make more immediately so that I could send some in her lunch to school.